Textiles have always played a central role in the evolution of human culture by being at the forefront of both technological and artistic developments. Herbs can be defined generally in commerce as a plant, plant part, or extract therefore used for flavour, fragrance, or medicinal purpose. An insect repellent help prevent and control the outbreak of insect-borne diseases such as malaria, dengue fever. Most plants contain compounds that they use in preventing attack from phytophagous insects. These chemicals fall in to several categories, including repellents, feeding deterrents, toxins, and growth regulators “Natural” smelling repellents are preferred because plants are perceived as a safe and trusted means of mosquito bite prevention. Plant-based repellents have been used for generations in traditional practice as a personal protection measure against host-seeking mosquitoes. Cotton is the natural vegetable fiber of great economic importance as a raw material for cloth. Cotton is a fabric that breathes even as it drapes the wearer in cool comfort. Organic cotton is cotton that is grown using methods and materials that have a low impact on the environment. Organic production systems replenish and maintain soil fertility, reduce the toxic and persistent pesticides and fertilizer and build biological diverse agriculture. Textile finishing usually includes treatments such as scouring, bleaching and dyeing. Medicinal plants are the gift of nature to cure limitless number of diseases among human beings. The abundance of plants on the earth surface has led to an increasing interest in the investigation of different extracts obtained from the traditional medicinal plants as potential sources of new Mosquito Repellent agents. In this study, 50’s combed cotton and organic cotton yarn was used for the study. The wet processing techniques used here were scouring, bleaching and dyeing .Then the yarn was dyed in package form using reactive dye. The dyed yarn was woven using Dobby loom along with plain weave structure. Then Mosquito Repellent finish is applied on the fabric by herbal and conventional process. Mosquitoes are incredibly unsafe insects and are responsible for propagating ailments like malaria, encephalitis (inflammation of brain) and dengue fever. At present, there are very few durable repellents that can be applied to clothing and almost all the repellents are designed to be applied directly on the skin. The fabric was padded in the Toluamide complex at the room temperature for 25 minutes and tested for Mosquito repellency. The herbal plant were identified and collected from the natural resources in a pure form. The following plant was chosen for the study Rosemary. The procedure begins with the selection of natural herb, which was screened and identified. 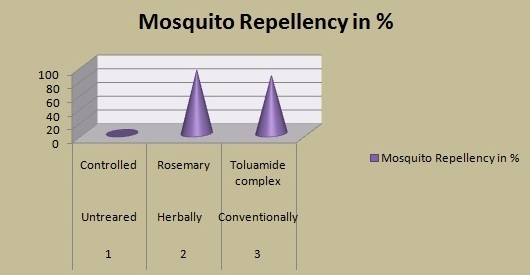 The extract was tested for its Mosquito Repellent which was done by Excito chamber method. Rosemary has been around for a long time, and therefore has a long list of claims regarding its medicinal uses, including use as a tonic, a digestive aid, to treat depression, headache, and muscle spam, and as an expectorant, promoter of menstrual flow, and stimulant for production of bile. Plant-based repellents have been used for generations in traditional practice as a personal protection measure against host-seeking mosquitoes. Knowledge on traditional repellent plants obtained through ethno botanical studies is a valuable resource for the development of new natural products. The selected sources were cleanly and safely collected from both living area and the forest area that were grown under optimal environmental condition that is free from disease and contamination. Required amount of dry powder is mixed with methanol; the container was closed and kept overnight. After overnight incubation, the extract was filtered through filter paper. After filtering the herb extract, methanolic solvents were evaporated and the herb extract were condensed. Specially designed two excito repellency test chambers were used to evaluate the efficiency of repellency activity. 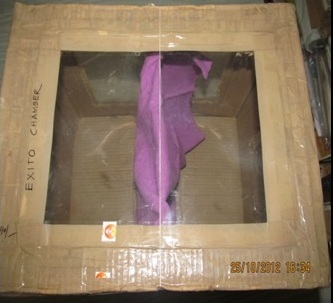 The wooden outer chamber of excito-repellency testing device measures 34 cm × 32 cm × 32 cm and faces the front panel with the single escape portal. The box is composed of a rear door cover, an inner Plexiglas glass panel with a rubber latex-sealed door, a Plexiglas holding frame, a screened inner chamber, an outer chamber, a front door, and an exit portal slot. Mosquitoes were deprived of all nutrition and water for a minimum of 4 hours before exposure. Laboratory tests were performed during daylight hours only and each test was replicated four times. Observations were taken at one-minute interval for 30 minutes. After each test was completed, the number of Escaped specimens and those remaining inside the chamber was recorded separately for each exposure chamber, external holding cage, and paired control chamber. Escaped specimens and those remaining inside the chamber, for the treated samples, were held separately in small holding containers with food and water. This research work has given a new idea in finishing of cotton and organic cotton with herbs for Mosquito Repellent activity (Rosemary). The treated fabrics were found to be very hygienic when compared to conventionally Mosquito Repellent finished fabrics. Carey AF, Wang G, Su CY, Zwiebel LJ, Carlson JR. Odorant reception in the malaria mosquito Anopheles gambiae Nature. 2010; 464:66–71.